Sonny (Maurice Benard) came to Anna’s house and told her he needed her help. 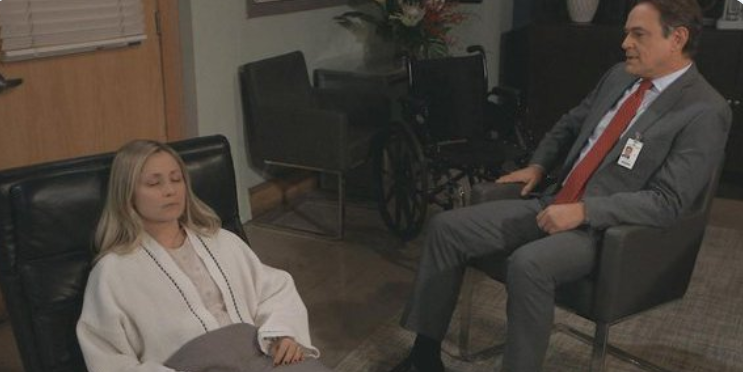 Ava (Maura West) confronted Chase (Josh Swickward) at General Hospital and demanded to know what the detective was doing to find Kiki’s killer. At Charlie’s Pub, Kristina (Lexi Ainsworth) asked Jason to talk with Sam (Kelly Monaco) about Shiloh (Coby Ryan McLaughlin) insisting Dawn of Day was the best thing that ever happened to her (Kristina). Meanwhile at The Metro Court, Sam told Shiloh she still didn’t trust him and hoped to turn Kristina over to her way of thinking. Franco was surprised when “Kevin” agreed to treat him again as he thought he’d (Franco) would have to sell him on the idea. “Kevin” explained with a serial killer on the loose, he could imagine how Franco’s old feelings about being a serial killer himself would come back to the surface. Laura (Genie Francis) shot down Lulu’s (Emme Rylan) decision to undergo hypnotherapy but relented after both Lulu and Jordan (Briana Henry) agreed not to proceed until they got the approval of Lulu’s doctor. Chase assured Ava they were doing everything in their power to find the killer, questioning him about Kiki’s (Hayley Erin) former roommate Franco Baldwin. Franco began his session with “Kevin” talking about how he’d pose his victims artistically and leave riddles for the police. Anna told Sonny if Dante were pulled off his assignment now it would put his life in danger. But Robert commented that he didn’t like Anna’s involvement with Sonny. Sam told Shiloh about doing what she had to in order to take care of her special needs brother Danny. Shiloh assured Dawn of Day could help her. Jason also told Kristina about Sam’s responsibility due to Danny. Jordan asked “Kevin” to provide hypnotherapy to Lulu and convinced Laura to allow it. “Kevin” assured he could separate the professional from the personal in order to help Lulu. Ava found Franco at Kiki’s grave. He thanked her for allowing him to be a part of Kiki’s life. Jason told Sam she’d have to play it smart to trap Shiloh. At Charlie’s, Sonny met Shiloh and non-subtly hinted anyone who hurt Kristina would have to answer to him (Sonny). “Kevin” was ready to start his hypnotherapy session with Lulu. At The Metro Court, Jason (Steve Burton) told Carly (Laura Wright) he and Sam (Kelly Monaco) broke up. When an angry Carly started to call Sam to give Ms. McCall a piece of her mind, Jason explained the break up was part of a con Sam was running in order to trap a man named Shiloh (Coby Ryan McLaughlin) who was luring Kristina (Lexi Ainsworth) in with his self help house Dawn of Day. Nina (Michelle Stafford) was thrilled when Sasha (Sofia Mattsson) came for a visit. Peter came to Lulu’s (Emme Rylan) office at The Invader. Looking at scene of the attack, Peter (Wes Ramsey) called the PCPD and demanded to know what was being done to find who attacked his employee. Maxie (Kirsten Storms) arrived and told Peter she had a huge favor to ask. Franco (Roger Hogwarth) and Elizabeth (Rebecca Herbst) took Aiden (Jason David) ice skating. Franco told Liz about resuming his therapy sessions with “Kevin” (Jon Lindstrom). Meanwhile, Jordan (Briana Henry) and Laura (Genie Francis) wanted to sit in on the hypnotherapy session, but Ryan refused, reminding that having onlookers would be unethical. Additionally, he refused to record the session as it was confidential. Lulu reasoned that if she remembered her attacker, a recording wouldn’t be needed. Maxie suggested Peter hire Liesl (Kathleen Gati) to write a medical advise column for The Invader. Liesl arrived with a sample of her writing; she searched the internet and wrote answers to people’s questions. Peter read Liesl’s work and admitted he liked her writing. He offered her a position on a trial basis. Liesl realized Peter was the man Maxie was considering moving on with and expressed her disapproval. However, she decided to accept Peter’s job offer. After Maxie and Liesl left the office, Peter called Valentin (James Patrick Stuart) and left a voicemail that he (Peter) hired Liesl and Valentin had Maxie to thank. Brad (Parry Shen) and Lucas (Ryan Carnes) joined Aiden skating. Franco told Elizabeth that being with she and the boys was the most important thing in the world to him. Liesl came to The Metro Court dining room. After Carly refused to comp Obretch’s meal to congratulate her on her new job, Liesl offered condolences on the loss of Carly’s grandson and made a remark about meeting the baby’s mother briefly. Jason wondered where Liesl could have met Nelle (Chloe Lanier). A clever Ryan hypnotized Lulu and tricked her into believing that she and Laura never discussed the number of Ryan’s victims on “Kevin’s” list was nine and not the seven the police knew about. Lulu continued to struggle to see the face of her attacker. “Kevin” urged Lulu the memories would come once she relaxed and didn’t force them. “Kevin” took Lulu back to her office on the night she was attacked. Lulu remembered going to the door but not being afraid when she opened it because the person was someone she knew. Then she saw he had a knife…it was Franco! Charlotte (Scarlett Fernandez) ran to Sasha (Sofia Mattsson)in the park, happy Ms. Gilmore had returned. Charlotte asked Nina (Michelle Stafford) and Sasha to join she and her papa for ice skating, but Valentin (James Patrick Stuart) said he couldn’t because he had a meeting with Ms. Tait (Katelyn MacMullen). 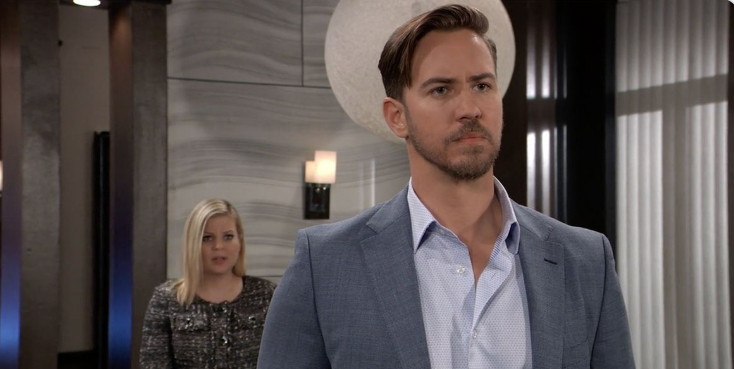 Maxie (Kirsten Storms) and Peter (Wes Ramsey) talked about Valentin and how he can’t be trusted. Peter commented Valentin had thousands of secrets and his actions were always motivated by the ends justifying the means. At The Metro Court, Liesl (Kathleen Gati) sent over a bottle of champagne to Finn (Michael Easton), Anna (Finola Hughes) and Robert’s (Tristan Rogers) table and announced Henrik/Peter just hired her at The Invader. After Liesl left the table, Anna decided to confront her son as he obviously loss his mind. 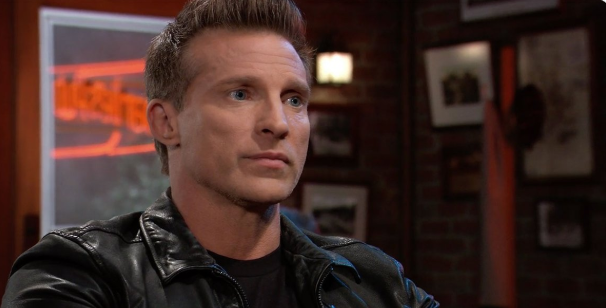 While Franco (Roger Hogwarth) and Elizabeth (Rebecca Herbst) are in the art therapy room, Ryan managed to convince Lulu (Emme Rylan) that the truth is her attacker was Franco. 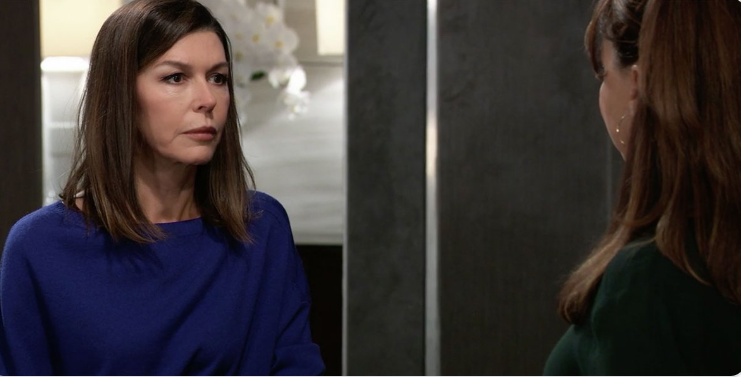 Ryan called Laura (Genie Francis) and Jordan (Briana Henry) back into the room where Lulu repeated what she “remembered” about the attack to her mother and the police commissioner. Sasha questioned Nina about why she hadn’t accepted Valentin’s marriage proposal yet, Nina answered that with her track record marriage was always the beginning of the end for her relationships. Maxie and Peter were about to kiss. Anna stormed into the office and demanded an explanation for why her son hired Liesl. She accused him of suffering from some weird sort of Stockholm Syndrome until Maxie explained that she was the reason for not only hiring Liesl but for also dropping the kidnapping charges against her. Peter told Anna that as Liesl was Nathan’s mother and James grandmother, he decided to give her the chance to be in James’ life. Anna warned her son to be careful and told Peter to come to her if he felt any danger from Obretch, but Peter reminded his mother he could take care of himself and didn’t need her to protect him. Laura called Elizabeth and asked her to meet her in Lulu’s room. Learning that Liz was in the art therapy room with Franco, Laura sent Jordan to arrest Baldwin. “Kevin” offered to be there in case Franco got agitated. But first Ryan stopped to “Kevin’s” office to retrieve Lulu, Kiki, Mary Pat and Peyton’s driver’s licenses. Jordan burst into the art therapy room with gun drawn and arrested Franco to Elizabeth’s shock. Nina announced to Willow she was remarrying Valentin and would soon be Charlotte’s step mother again. Elizabeth left a voice mail for Scott (Kin Shriner) and told him he had to get to the PCPD. When she saw Lulu and Laura, Liz insisted Franco was innocent and Ms. Falconieri’s history with him caused her to be mistaken. Back in Kevin’s office, Ryan smiled looking at his remaining driver’s license trophies and told them their friends had to leave because they were being put to good use. Sonny (Maurice Benard) ran into Margaux (Elizabeth Hendrickson) at The Metro Court and reminded her that Franco (Roger Hogwarth) was acquitted of his crimes due to a brain tumor defense and he didn’t want it happening again. Franco vowed to Jordan (Briana Henry) he’d sue the PCPD for false arrest. Elizabeth (Rebecca Herbst) was upset when she found Chase (Josh Swickward) searching Franco’s art therapy room at General Hospital. She ran into Griffin (Matt Cohen) in the hall outside the art therapy room and told him about Franco’s arrest. Liz insisted Franco was innocent. Sonny found Alexis (Nancy Grahan) reading Shiloh’s (Coby Ryan McLaughlin) book and they talked about their impressions of the man. Scott (Kin Shriner) arrived at the PCPD to represent his son. He asked Franco how he was holding up. Franco was worried about Elizabeth’s boys as it must have upset them when the police went through their things searching for evidence. As the police had a court order, Chase appeared in Kevin’s office for Dr. Collins’ patient file. Ava was already in the office and after Detective Chase left asked whether it was a patient who attacked Lulu (Emme Rylan). When he told her it was Franco, Ava didn’t believe it…something was off. Ryan explained he helped Lulu remember her attacker through hypnosis. Dr. Terry Randolph (Cassandra James) gave Kim (Tamara Braun), Drew (Billy Miller) and Oscar (Garren Stitt) good news that the tumor hadn’t grown. Oscar was happy and left to tell Josslyn (Eden McCoy). Terry reminded Oscar’s parents that although the tumor grown, it hasn’t shrunk so Oscar’s prognosis hasn’t changed unless the tumor begins to shrink. But this was a temporary reprieve so Dr. Randolph encouraged Oscar’s parents to enjoy it. Elizabeth found a sketch Franco did of their pending wedding; she was convinced he couldn’t have done what he’d been accused. No sooner had Jordan told Margaux their case against Franco was circumstantial, the police commissioner received a text and announced their case just turned around. At Charlie’s, Oscar told Josslyn that he just got good news that his tumor had shrunk. Julian (William deVry) was happy to hear Oscar’s medical condition was improving and later when Kim arrived, she and Julian shared a kiss which Alexis witnessed as she started to enter Charlie’s. Ava and “Kevin” got into a fight when she accused him of keeping secrets from her about Franco. Ryan grabbed her by the arm. Ava told “Kevin” she didn’t like him much right now. Ryan angrily shoved things off Kevin’s desk. At the PCPD, Jordan showed Franco and Scott the evidence the police undercover at the art therapy room: the driver’s licenses of the victims. Elizabeth arrived at the PCPD and dropped sketch Franco had drawn to the floor when she found out about the driver licenses. Ava literally bumped into Griffin and cried on his shoulder over the news about Franco being a suspect in Kiki’s (Hayley Erin) murder. Ryan wasn’t pleased to witness the tender scene. At The Metro Court, Sonny (Maurice Benard) told Jason (Steve Burton) he read Shiloh’s book and like Jason, doesn’t buy a word of it. Spinelli (Bradford Anderson) arrived and announced his research his gathered about Shiloh’s backstory checked out. Sam (Kelly Monaco) arrived at Dawn of Day and told Kristina (Lexi Ainsworth) and Shiloh that she’s there for a tour and have come with an open mind. Shiloh told Sam that Kristina had to leave to do outreach for Dawn of Day’s Valentine’s Day event. Julian (William deVry) learned Alexis (Nancy Grahan) was no longer treating with Kevin (Jon Lindstrom) due to a conflict of interest as she’s representing Laura (Genie Francis) in her divorce from Kevin. Alexis met a man at the bar at Charlie’s Pub who was a doctor with an interest in Russian history. She told him about being an alcoholic and her relationship issues. The man suggested they resume their conversation over dinner sometime and left his business card face down on the bar in case she changed her mind about dating. Ryan (also Lindstrom) approached Griffin (Matt Cohen) who was waiting to give blood. Ryan asked Dr. Munro whether he knew where Ava (Maura West) was, saying he (Ryan) saw them hugging earlier…did Griffin have something to tell him man to man? Kristina ran into her father at The Metro Court and gushed over Shiloh and Dawn of Day. She explained they were like the family she never had; a family she hadn’t been born into with expectations of her. Sonny told his daughter how Mike (Max Gail) was slipping away and said Kristina should spend time with him while he still remembered her. Shiloh suggested he could help Sam deal with her fear of commitment. Scott (Kin Shriner) produced a court injunction and told Jordan (Briana Henry) and Margaux (Elizabeth Hendrickson) that they couldn’t charge Franco (Roger Hogwarth) until after he’d taken an MRI. Both Jordan and Margaux view the move as a stalling tactic. Which it is as Scott later tells Elizabeth when they arrive at General Hospital to talk with Griffin about performing the MRI. Ava saw Franco waiting to have his MRI and after they talked assured him she didn’t believe he’d kill Kiki. Spinelli told Jason about a woman named Harmony who was Shiloh’s partner in opening Dawn of Day houses. Jason wondered why Harmony hadn’t come to Port Charles with Shiloh. Jason decided to go to Beecher’s Corners to meet with Harmony. At General Hospital, Franco told Elizabeth his fear the tumor had returned without him knowing and he was guilty of the murders. Ryan decided to kill Griffin but with Franco in jail make it appear a suicide due to Dr. Munro’s depression over Kiki’s death. To that end, he lured Dr. Munro to the roof of General Hospital on the pretense of using the view to pick the perfect spot for a memorial stone for Kiki. While Griffin looked over the side, Ryan took out a syringe. The Week in Review I wrote for General Hospital for The Nerdy Girl Express.